But first, some caveats. The statistics below are almost certainly wrong. I will have made mistakes. My definition of an escape room may differ from yours. I may not know of some venues opening or closing. The data may be (up to a month) out of date for some places. I believe it’s pretty accurate, though and, for the purposes of this article, the odd inaccuracy here and there isn’t going to matter too much. On top of reporting numbers, I’m going to put forward a little of my own analysis. Any numbers beyond raw room counts are likely to be made up and should be taken with a pinch of salt. Any opinions are my own and, based on experience, likely to be horribly wrong. In short, don’t rely on any of the below without doing your own research! However, if you disagree, I’d love you to discuss it in the comments below! If you want raw numbers, the UK has 1139 rooms spread across 288 companies with 415 distinct venues. If you’re interested in how many different games you could play, there are 852 distinct scenarios across the country. In the past year, that represents an approximate 42% increase in room count. That’s a relatively small percentage compared to previous years (93%, 148%, 409%) but, in terms of raw numbers, it’s quite similar to the most recent jump. Things haven’t stopped yet! As ever, there’s a different story in different regions. North West England continues to rule the roost in terms of per-capita room count, but Scotland and London, which used to vie for that top spot, seem to have plateaued recently. Meanwhile, Yorkshire, SW England and the East Midlands, which all used to lag badly, have finally taken to the industry and are now challenging for the top spot. Special mention for the East of England, a late entrant to the market but which is now moving on in leaps and bounds. The good news, though, is that few places are closing. Ignoring games which were always likely to be temporary, I’d suggest that a total of 18 venues, or just 5% of the market, have closed down in the past year. Reasons vary hugely, but there doesn’t seem to be a cluster of closures anywhere, and few have had catastrophic ends, with most of them just bowing out because, while the business was still making money, other opportunities were more tempting. But enough waffling! A picture is worth a thousand words, so here are a couple of charts to give you a feel for growth in the UK and Ireland. First off, the number of rooms per capita across the two countries, which gives you an idea of the general growth of the industry. …and now, a breakdown by NUTS 1 regions (so London, Scotland, NW England and the like). You can clearly see NW England in the lead (coincidentally, the location of the most UK bloggers…), while long-time challengers Scotland and London have dropped down to mid-table obscurity. I realise that’s all in colour and may be hard to make out – if you want to see the details, drop me an email. I often get asked by people how big the industry is. It’s hard to say for sure, especially since, anecdotally at least, a lot of bookings are being made last minute these days – people looking for availability the night before or even on the day. But… there are currently 1139 rooms in the UK. Those rooms are typically filled at the weekends and evenings only. I see around 12 slots a week on average from the handful of sites I looked through across the country – I’d probably up that to 15 per week given that owners believe the heat and the exam season have been dampening numbers. The average cost per room is probably around £60. 1139 rooms * 15 bookings/week * 60 pounds/booking/room * 52 weeks = ~£53,000,000. So I’d estimate the industry having somewhere in the region of a £53m turnover this year. Assuming an average of four people per room, I’d estimate a total of 3.5 million players coming through the doors (though obviously that’s double-counting some people!). If you’re an owner thinking “I don’t make my share of that!”, remember that some companies skew things a little. For example, Enigma Quests still seems to be fully booked for School of Witchcraft and Wizardry, which represents something like £300k a year for a single room. When Time Run’s new venture, The Game is Now, opens in November, it could, with full occupancy, rake in something like £7m a year. I don’t think it will be anything like that level but, even if it only takes a third of that, it will have a significant impact not just in directly contributing to the number but in dragging new players into the market. Where will we be in a year? Truthfully, I don’t really have a confident answer. By Christmas, we should have officially licensed Doctor Who and Sherlock games, which will increase the exposure in the media, something that’s likely to drive industry-wide growth. Other entertainment industries continue to get on the bandwagon: theme parks, golf courses, cinemas, museums, castles, bowling alleys, laser tag… The list goes on. For me, the problem with escape rooms has always been exposure and conversion. Getting the message out there and then, even if people have heard of them, convincing them to play. That seems a far easier proposition if potential players are hanging around the venue and see happy people coming out. It’s not just escape rooms we’re seeing, though. More puzzling-treasure-hunt-style games are popping up with the likes of Onigo in London, Kryptos in Oxford and Cluetivity in a variety of venues round the country. VR is becoming ever more popular too. A string of generic VR centres, plus a few dedicated games such as Mind Horror in Omescape, have opened up in the past twelve months. I’ve seen three truly impressive VR escape-like experiences since last summer: The Void, Huxley and Ubisoft’s Assassin’s Creed game. All seem plausible entrants into some of the bigger UK city markets, so watch out for them and more. Hybrid experiences are becoming prevalent – the Grid in London sees a cocktail bar, escape room and immersive theatre fused together. Scare attractions continue to test out the waters with escape-style scare experiences and are increasingly finding the balance between scare and solve. It seems fairly natural that immersive theatre and other experience-led companies will continue to look to the escape room industry for ideas. Talking to the team behind Twisted Rooms in Germany, they closed down their first generation of escape rooms to focus on Opolum, which is more geared towards experiences than escaping. They’d partnered with Hamburg Dungeons and found that the more mainstream market is interested in adventures rather than puzzles. As theme parks start to build escape games, and as the Dr Who/Sherlock-style games drag in non-puzzlers, I expect that trend to continue – if you’ll pardon the pun, people are increasingly looking for escapism. Worryingly for the smaller players in the industry, the large brands continue to expand their market share. 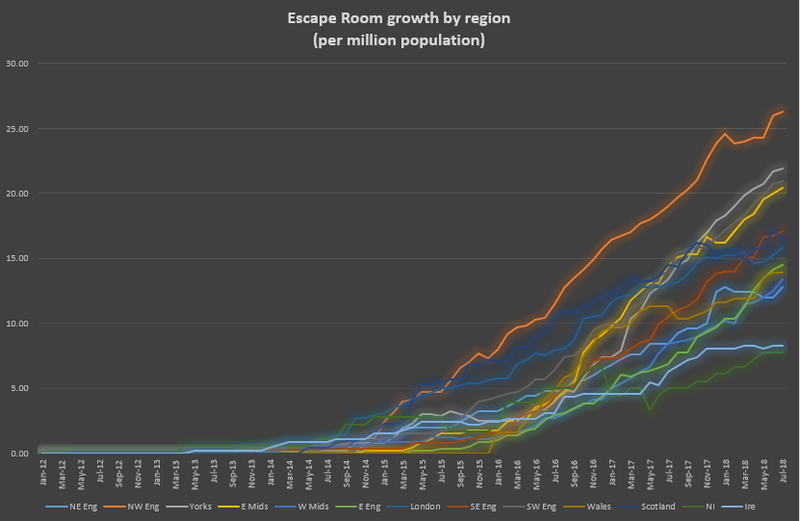 Escape-designed games now represents around 10% of UK games, while Clue HQ, Escape Reality and Breakout have around 5% each. Although these are still small numbers, they’ve been growing faster than the industry as a whole. Escape Hunt may have a small market share, but they’re growing fast too and have the cash to fund it, so I expect their 1% market share to expand rapidly – maybe close to 5% by year end? I don’t think so. Monique and Alex from the Panic Room are testament to that: they’ll soon have fourteen rooms in Gravesend, a town with a population of just 70,000. That’s one game per 5,000 people – more than ten times the UK average – and their occupancy is still well above average. Granted, they probably draw in players from outside the town but, even if they were the only provider in the whole of Kent, that would still put them on a par with some UK regions. Build the right rooms, give the right customer service, and there is plenty of room in the market. It seems pretty clear that growth will continue to slow down, but I’d be shocked if we saw an implosion in the market as has been seen in some Eastern European countries. The tougher planning laws in the UK, while being incredibly frustrating to those of you who’ve set up games, has meant that there’s been a gentler growth than in many countries, and any correction in the market will be consequently softer. Personally, I think we’ll still see an increase throughout the rest of this year and for most of 2019, with the market maybe plateauing towards the end of next year. It’s hard to predict, though. For example, if a TV show revolving around escape rooms appeared on a mainstream channel, that could massively change the market. In the next year, I think the market will slow in growth, in terms of volume of rooms, with a focus on customers seeking higher quality, more immersive experiences. We may see the rise of “big-production” games as some of the bigger brands, and external gaming companies, start to dominate as a result of a greater level of customer awareness about games in general. Hollie Kelly, Breakout Games (Scotland) and Mindlock York. I think that a very quick answer is that you will see a lot more growth in the UK. It is still such an immature market with so much potential. The barriers to entry are still considered relatively low, though a certain level of investment is required to deliver a quality experience (see below). I think that the UK High Street will continue to struggle, and companies who provide experience-based activities in town centres will continue to be welcomed. I don’t think that escape rooms need to continue to use more and more technology to be successful, but I do think that the ones that will thrive will have an absolute focus on quality (rooms, storytelling, immersion and engagement) and a mania for exceptional customer service. I believe that a quality will be set by customers who expect a better – if not the best – experience that can be offered. Smaller companies who focus on “traditional escape rooms” will fall behind and eventually be forced to close, leaving a number of “big players” to divide the market. Franchises will go one of two ways; in that the whole brand is tarnished to a point of no return, or they will have the funds to start buying out competition… The effect of which isn’t easy to swallow, nor is it a thought I like to dwell upon. In 5 years’ time, there will likely be fewer companies but more rooms across the UK, similar to the market development of the likes of bowling, laser quest and mini golf. The closest comparable market – in growth – which trends in a similar fashion to Escape Rooms is cinemas, and we look now to find that there are several main brands of Cinema with few smaller companies on the fringes. If we were trying to project where the Escape Room industry is going, then our closest reference point would be the trends of the cinema industry. – Simon Stokes, Escapologic (East Midlands). 2019 will be the year to remember for the sudden increase of dichotomy in quality. The advent of official IP games will exponentially raise awareness of the genre and, with that, the market’s expectations for quality and value. For owners that are quick to respond will flourish, and for owners that don’t will quickly get left behind. Sam Wai, CEO Enigma Escape (London). I think more competition will come into the major cities, making it less profitable for all those who operate in those cities. I think tie-ins such as the Dr. Who room will become more commonplace. 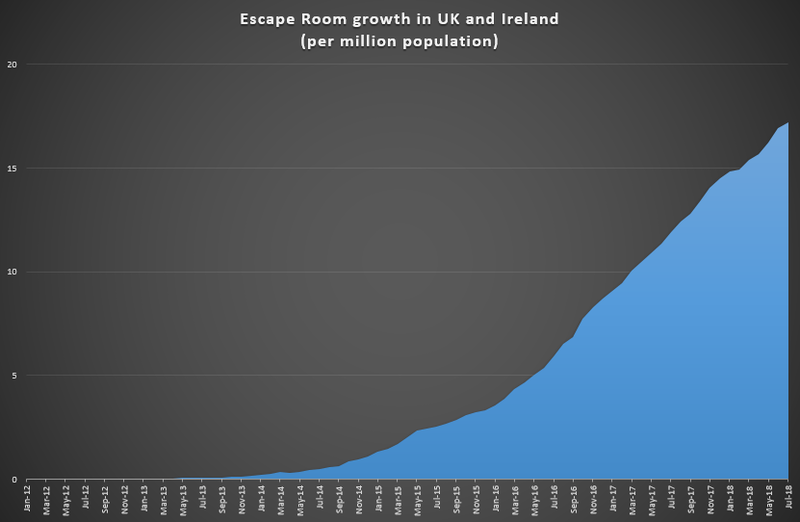 I’d say escape rooms are only really hitting the main stream now, so most escape rooms should do very well in the next 12 months. I hope that companies keep being creative with their rooms rather than playing it safe and mimicking what’s already out there. – Ed Roberts, Breakout (NW England and Wales). I think the sweaty summer of 2018 will be seen as a quiet summer before a winter of frenzied activity. I think you’ll see consolidation in the market: solid escape brands with good reputations, reaching further towards the mainstream. Obviously the Sherlock and Dr Who games will help with that, as their reach goes beyond the normal escape game audience. But, in addition, you’ll see pop-ups, museum partnerships, all manner of spaces with ripe environments searching to work with existing brands to create experiences in existing locations. Depending on the outcome of the political situation, we might see an influx of foreign visitors flocking to a weak pound, so tourist locations will do exceedingly well. As for what happens next… Escape Games will continue to get better. More immersive. More clever. What excites me most, permanently, is the quietly radical innovations in format that are happening across the industry. Who knows what will happen next? Nick Moran, Time Run/Sherlock: The Game is Now (London). What do you think will happen to the industry? Feeling brave? Make your predictions below and see how they look in a year’s time! I think will be similar to the diffusion of innovation curve and it’s common to what you see in other areas of business where you have the early innovators who came on the scene early e.g. 2013 and they had low competition but had more education to do then 2015/2016 I’d say was the time of the early adopters. When I opened I was the only permanent room in Essex and people traveled from across the county. Now we are in the stage of the early majority I’d say and people are served by more local rooms so in my case in places like Bishops Stortford, Harlow, Chelmsford, Basildon, Romford, Southend, Clacton, Colchester. We then move into the late majority where you start to see more established brands moving in who like to operate more safely when others have already educated the market. We start to see little bits of this. We see some companies establishing their brands and expanding both the franchises and the independents like Exciting Escapes and our friend at Chelmsford Escapes who are moving into two new locations soon… other places are building where they are like Panic Rooms. The bigger brands will have the buying power to create bigger experiences and have investors. If you think about the process of gentrification you have all the interesting people – the musicians and artist that make a place interesting draw in other people who are attracted to that but then they prices go up and the neighbourhood changes – the coffee shops come and the place gets “cleaned up” and those cool interesting people move out. In Internet terms the AOL’s and Compuserves came along and offered IRC channels but without any of the alt channels. They made it all family friendly but it meant that the things got a little less interesting. It’s my hope this won’t happen in this industry – as others mentioned – how many small independent bowling alleys, cinemas, laser centres are there. We will likely see buy outs of some of the smaller companies by bigger companies – some who are already in the market and others who will come into it. It may become challenging for those without big budgets to compete against the bigger players profitably – the easy money has gone – you can’t open a room at a lower budget now so easily so room costs go up but ticket sales stay same kind of price. So to this we start to see people also evolving their businesses and moving into new markets – in US you see people moving into VR and Axe throwing and people in UK are looking at related industries such as treasure hunts. Personally I’m looking to grow the corporate side of my business as my location is suited well for this with multiple activities, an interesting location and a lot of space. When we first started the escape room business in 2016, I predicted a 5 year increase before all the fun starts. So far I am sticking to this, so 2 years in and entering the third year, I think there is plenty of room fro growth for everyone. What is important now is making quality rooms, first time players having a bad experience ruins it for the whole industry, as it is unlikely that they will play again anywhere. A good experience almost guarantees ongoing traffic. And as we all know, our rooms are a one time thing, so we need a large audience, but not a sole audience, every customer can be shared, providing they are good rooms. I think that next year and the year after will see improvements in game design, padlocks will reduce in number, and escape rooms will increase. After that will be saturation and the exisiting rooms with the existing clients will be safe, but making new rooms almost impossible to start. So in a nutshell, its all good. CTRL ALT ESC – Margate.